It always starts out in an inauspicious manner. You meet someone new, and they wind up changing your entire world. In this case, the “someone new” is a Russian Blue named Buster. 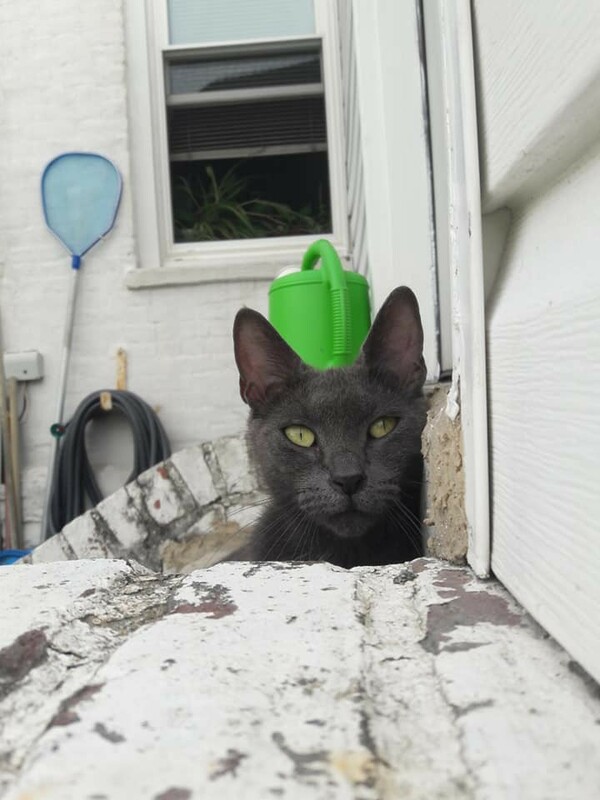 A few weeks ago, my wife noticed a new addition among the backyard denizens that includes possums, an occasional raccoon, a family of Cardinals, and at least three different cats. Pretty soon, she started calling him Buster. “Hey buster. Whatcha doing Buster?” I knew we were in trouble. It was just a matter of time. After a few nights of investigation, Buster managed to break into the backyard trash container and help himself to the leftovers of that weekend’s BBQ. My instructions were the same. Our oldest, Brandon, broke first, slipping the cat a few snacks from the treat bag that was previously reserved for our indoor cats, Mackey and Riley. I wasn’t pleased. I knew what comes next. “I just gave him some dry food”, Val said when I noticed an empty dish next to the water bowl that had been placed in the yard. “I told you not to feed him!” I screamed to deaf ears. “Did you see how beautiful he is?” was her response. Two days later, Buster gifted my wife with a dead field mouse. The courting had begun. “No she ain’t”, he responded in the grunt that we’ve become accustomed to. Within days, we fell into a predictable pattern, Buster would be at the back door, crying, while Mackey and Riley would be in the kitchen, also crying. Mackey and Riley get fed first, then Buster. This went on for a few weeks. “No she ain’t!” He responded. Valarie began to discuss possibly taking the cat to the vet to get spayed, lest he start marking his territory in our yard and leaving us with that lingering odor that permeates the yards where feral cats live. I conceded that it was probably a good idea. Pretty soon, I too was feeding Buster when 5pm rolled around, even getting to pet his head on occasion. Val and Buster were already best pals, spending evenings together as she tended the vegetable gardens. One evening I heard my wife’s voice as she barked, “Get the hell out of here!” I glanced out the window to see Val yelling at the orange Tomcat that has been roaming the yards for some time now. My wife is racist towards orange cats. Not soon after, I made a keen observation. “You’re crazy. It’s your imagination.” She responded. We continued to discuss what to do about Buster, as Val started to grow closer to the cat, even coaxing him into the pet carrier with some cat snacks for the inevitable trip to the snip-snip room at the vet. All the while, I continued my two observations. “No she aint!” Said Mike. “No he ain’t!” Said Val. Pretty soon, it became evident to anyone and everyone, Buster was indeed getting fatter in the belly. Trickery was afoot. Buster pretty much spent most of his time in our yard, but there were times where he would disappear and we would wonder where he was going. That mystery ended when I discovered tufts of grey hair on the plywood board that covers the crawlspace under the porch. Valarie did her best to seal up the opening, but alas, when there’s a will, there’s a way. 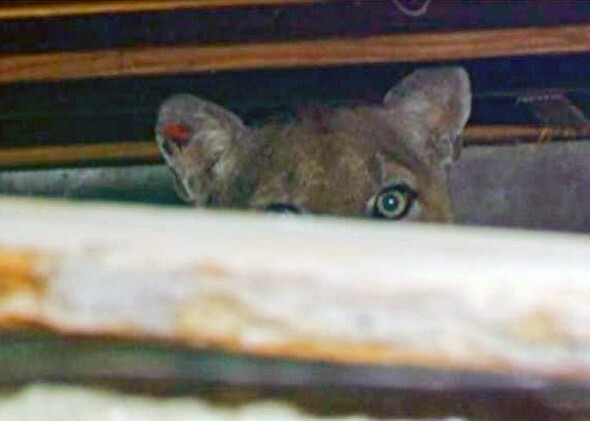 Could be worse, some couple in Los Angeles had a panther sleeping under their house. At least Buster only ate dry food. Finally, Val made an appointment with Feral’s in Peril on Sunday to have Buster checked out, and if need be, snipped in all the proper places. On Saturday morning, Buster made his usual appearance at the 7am feeding. That was the last we saw of him. When I went outside to feed him at 5pm, he was nowhere to be found. Val went back out at 7, and 8.. and again at 10. We checked under the crawlspace. She was crestfallen when I spoke to her that night. I tried to assure her that everything was ok. He probably just went back to whatever other house he was grubbing food from. Either that, or my suspicions were correct, and fat Buster was off having a litter somewhere. Secretly, I feared the worse. When I got home from work on Sunday, I walked around the block to see if he had gotten clipped by a car on one of his late night excursions. Luckily, there was no evidence of that. Sunday morning feeding came and went. No Buster. By now, I was worried that some horrible fate had befallen Buster, all the while trying to assure my now broken-hearted wife that Buster had found a nice home. “Is it her?” She asked excitedly. “Her?” I responded with arched eyebrow. Indeed, the sleet and svelte Buster, with after-birth crusted tail and legs had returned to our yard. “I think I’ll call her Bella.” Valarie McAllen announced. I imagine that in some point in the next few weeks, we will begin to hear the sound of newborn kittens stirring under the house. I’m anticipating several orange and gray kittens will be making their appearance right around Labor Day. At some point Bella and her litter will have to be taken to the vet, en masse to be fixed and treated. Then Bella will have to be incorporated into the family with the other two felines. This house is getting more and more crowded by the day. Ok. Who wants first dibs on a kitten? Nice story. Heard it before… no, correction. Lived it, before, before again, and now at Vicky’s in Jersey. The damn kittens are too cute.